Calliope Digital, Maker of WDSU’s Parade Tracker, Claim They Aren’t!! This is another exclusive story for Carnival New Orleans News. On wdsu.com’s Parade Tracker site, they claim with a link and email that Calliope Digital is the creator of the mobile application. I’ve been in touch with Chris V. of Calliope Digital via email because I want to delete the program from my phone after I received over 100 texts over the course of the South Shore parades the very first night of parades! That’s way too many for me! Calliope Digital, LLC announces the release of the WDSU Parade Tracker for Android. The WDSU Parade Tracker is New Orleans’ original FREE parade tracking app for the Carnival season. Now with more parade schedules, parade routes and more real-time tracking of your favorite parades. This year, we’re tracking 30 parades in Uptown New Orleans, Metairie, and on the West Bank. And best of all, this app keeps you up-to-date with the latest carnival news and changes in parade schedules and parade routes. Get it free on Android Market today. The WDSU Parade Tracker is New Orleans’ original FREE parade tracking app for the Carnival season. Now with more parade schedules, parade routes and more real-time tracking of your favorite parades. This year, we’re tracking 30 parades in Uptown New Orleans, Metairie, and on the West Bank. It’s the “must-have” app for Mardi Gras day and best of all, keeps you up-to-date with the latest carnival news leading up to Fat Tuesday, including auto-updates in schedules and parade routes. The following emails are from Calliope Digital Founder Chris Van Buskir and myself concerning me getting rid of the pesky program. Me as well, as the app I built does not send notifications. We do not send texts. We do not collect phone numbers. I have no clue as to what you are talking about. WDSU’s site lists Calliope Digital as developer and have the link to your site and the email I used to contact CD. I’m puzzled about your response. No I didn’t. It was probably something they did prior, so contact them directly. WDSU does, and you created the program from them. So if you cannot help me, can you give me an email to send this to so I can get this off my phone. Thanks very much. ???? We don’t send out texts, notifications of any sort. We don’t collect phone numbers. I desperately want this off my phone. I don’t mind Orleans parade updates, but not the entire South Shore. I cannot find a way to do this, the app isn’t listed in my downloads, or my programs. Please help and Happy Mardi Gras!! I’m a big fan of this parade tracker system, when you want to find the start of a parade that’s rolling or a parade stops for some reason. How does the system operate? WDSU puts a car near the front of the parades they cover. The car uses the GPS tracking system to pin point where the tracking car is, and relays that information to a computer, which texts that info to all opt in phones. The system is a bit intrusive when you are already at a parade, catching throws and enjoying the sights and sounds of of the event. You constantly receive parade updates on your phone, when you don’t need them, as you are already parading. You could always opt out when at parade, and opt back in when you are searching for a parade on the street. However you might think this is a bit much opting in and out. To get Parade Tracker updates on your mobile phone, text “follow parades” to 40404. This is the second year for this service. If you opted in last year, you were automatically opted in for this year. For some parades, you can track the parade’s progress on WDSU.com, via a special map. The markers on the map show the location of the lead float in the parade, and they update every 10 seconds or 20 feet. The biggest flaw in the system is they skip parades! Babylon had to switch days because of bad weather. Could parade tracker keep up with parade rescheduling? NO. No parade tracking for Babylon. Earlier in the Carnival season, when some of the smaller parades roll, parade tracker opted not to cover the earlier parades. Among the Orleans parades that WDSU opted not to track were Sparta and Ponchartrain. My thoughts on the inconsistent tracking is that if you are going to offer a parade tracking system, you should cover all the parades in an area. 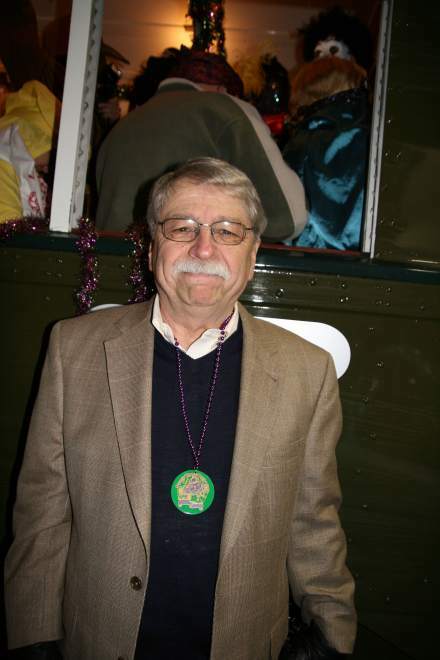 Kudos for the new GPS system which allows the parade participator to receive text updates via Twitter from GPS units in the front and rear of New Orleans parades. Last night, for example, the updates came for Babylon, Chaos, and Muses. It’s very convenient to receive up to the minute parade location information while the parades are rolling. Some key information is omitted. For example, last night during Chaos,there was a break of 50 minutes. No more updates for Chaos and the parade behind, Muses. Why did the break occur? As WDSU receives information on the breakdown, they could easily pass this on via Twitter. Virtually everyone who attends a parade wants to know why any long breakdown occurs. There’s always a reason- broken float, accident, a rider falls off the float, etc. Also, once a parade is rolling , the Twitters pile up on a three parade night and clog your inbox quickly. All things considered, the WDSU Parade Tracker is a success.